I am set to be creative this winter. I have my needles, yarn, crochet thread, beads, hooks, instruction books and kits. 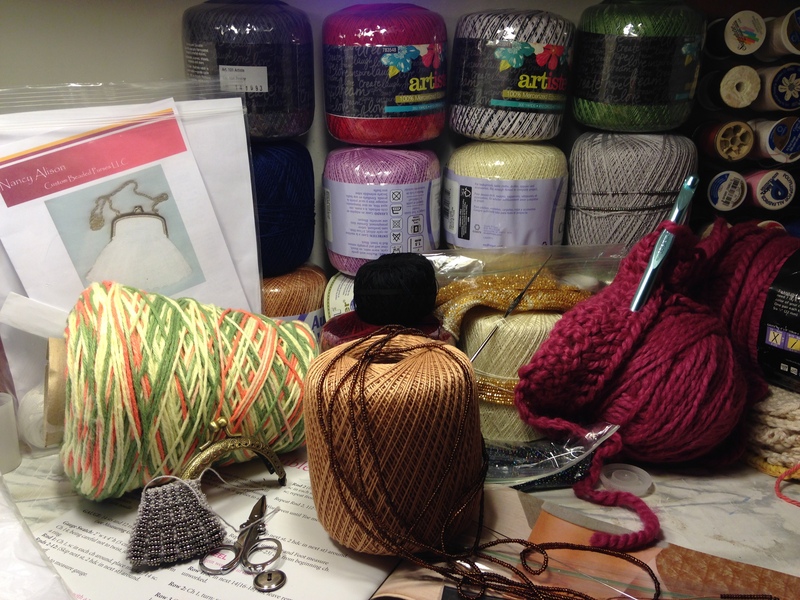 New this winter: bead knitting, beaded knitting (there is a difference), making cowls, knitting socks, slippers, and crocheting a table runner. Yes, I will macrame also. It may have taken two months to get the hang of knitting with beads, but I am really enjoying it. It is so much fun watching the article form and become something small and beautiful. I finished the body of a gray/silver bead pouch, but I am waiting to finish a couple different colored ones before adding the neck and fringe. I have just separated all the decorative beads that I have and I will be able to create a pretty pattern for them later. I will show and tell more later. Thanks for stopping by. This entry was posted in Main Page and tagged bead knitting, beaded knitting, beads, crochet, knitting. Bookmark the permalink.